Sonic the Hedgehog is turning 25 this year and the blue blur has yet to lose a step. Learning more about the character is always a good time which is why Humble Bundle and Archie Comics are offering up a big digital collection of Sonic the Hedgehog comics. The Humble Comics Bundle: Sonic the Hedgehog features hundreds of pages of action-packed excitement from the longest-running video game comic book in history. Customers can pay $1 or more for Sonic Universe Vol. 6: Treaure Team Tango, Sonic the Hedgehog #264-272 & #276-279, Sonic Universe #45 & #55-58 and Sonic Boom #1-4. Those who pay more than the average price also receive Sonic the Hedgehog #260-263, Sonic Universe #59-74 & #83-86, Sonic Boom #5-7 and a bonus title revealed on Wednesday, June 29. Customers can pay $15 or more to receive all of the above, plus Sonic the Hedgehog #226-229, #252-259, #280-283, Sonic Universe #18-20, #75, #79-82 and Sonic Super Digest #13-16. A free sampler of Sonic comics is also available, and includes Sonic the Hedgehog Vol. 1: Countdown to Chaos, Sonic Select Vol. 9: The Games and Sonic the Hedgehog Vol. 2: The Chase. These comics usually cost as much as $291. At Humble Bundle, though, customers choose their price! To see the full bundle, head to bit.ly/HBSoniccomics. 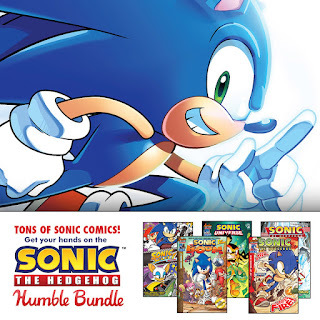 The Humble Comics Bundle: Sonic the Hedgehog runs from Wednesday, June 22, 2016 at 11 AM Pacific time until Wednesday, July 6, 2016 at 11 AM Pacific time. San Francisco, Calif. - June 22, 2016 - In celebration of Sonic the Hedgehog’s 25th Anniversary, Humble Bundle and Archie Comics are offering up a big digital collection of Sonic the Hedgehog comics! The Humble Comics Bundle: Sonic the Hedgehog features hundreds of pages of action-packed excitement from the longest-running video game comic book in history. Customers can pay $1 or more for SONIC UNIVERSE VOL. 6: TREASURE TEAM TANGO, SONIC THE HEDGEHOG #264-272 & #276-279, SONIC UNIVERSE #45 & #55-58, and SONIC BOOM #1-4. Those who pay more than the average price also receive SONIC THE HEDGEHOG #260-263, SONIC UNIVERSE #59-74 & #83-86, SONIC BOOM #5-7, and a bonus title to be revealed on Wednesday, June 29! Customers can pay $15 or more to receive all of the above, plus SONIC THE HEDGEHOG #226-229, #252-259, #280-283, SONIC UNIVERSE #18-20, #75, #79-82, and SONIC SUPER DIGEST #13-16. A free sampler of Sonic comics is also available, and includes SONIC THE HEDGEHOG VOL. 1: COUNTDOWN TO CHAOS, SONIC SELECT VOL. 9: THE GAMES, and SONIC THE HEDGEHOG VOL. 2: THE CHASE. These comics usually cost as much as $291. At Humble Bundle, though, customers choose their price! As with all Humble Bundles, customers can choose how their purchase dollars are allocated, between the publisher and charity. The Humble Comics Bundle: Sonic the Hedgehog supports The Comic Book Legal Defense Fund, and customers can also choose a favorite charity from our database of over 30,000 charities. The Humble Comics Bundle: Sonic the Hedgehog runs from Wednesday, June 22, 2016 at 11 a.m. Pacific time until Wednesday, July 6, 2016 at 11 a.m. Pacific time. Humble Bundle sells digital content through its pay-what-you-want bundle promotions and the Humble Store. When purchasing a bundle, customers choose how much they want to pay and decide where their money goes -- between the content creators, charity, and Humble Bundle. Since the company's launch in 2010, Humble Bundle has raised more than $74 million through the support of its community for a wide range of charities, providing aid for people across the world. For more information, please visithttps://www.humblebundle.com.